OCT 11TH Update: LSU Tailgate is now 97% sold out! Tailgate will host a 12ft x 7ft LED screen for game viewing option! THURSDAY Rooftop Rendevous @ HOT TIN Choice cocktails, champagne & city views at a chic rooftop bar at the Pontchartrain Hotel. Non-ticketed, casual meet-up w/ late night spot to follow. 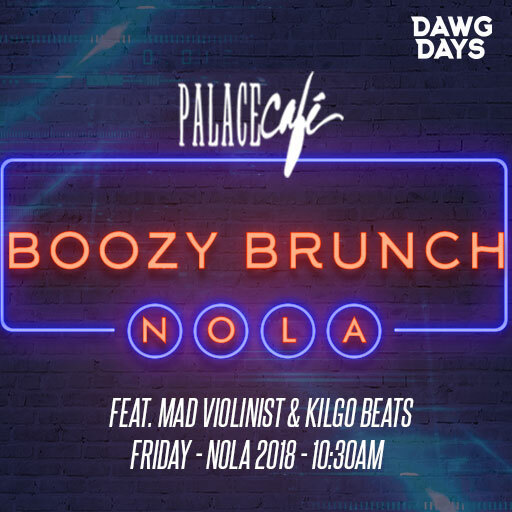 FRIDAY (BRUNCH + PARADE) Boozy Brunch @ PALACE CAFE (Includes Multi Course Brunch + Bottomless Mimosas / Bloodies) feat. 6x grammy-nominated The Mad Violinist (w/ DJ kilgo). Ticket includes post-brunch UGA Second Line Parade w/ band! SATURDAY Battle on the Bayou @ GEORGIA @ LSU Buses + Tailgate Party on LSU campus in Baton Rouge. 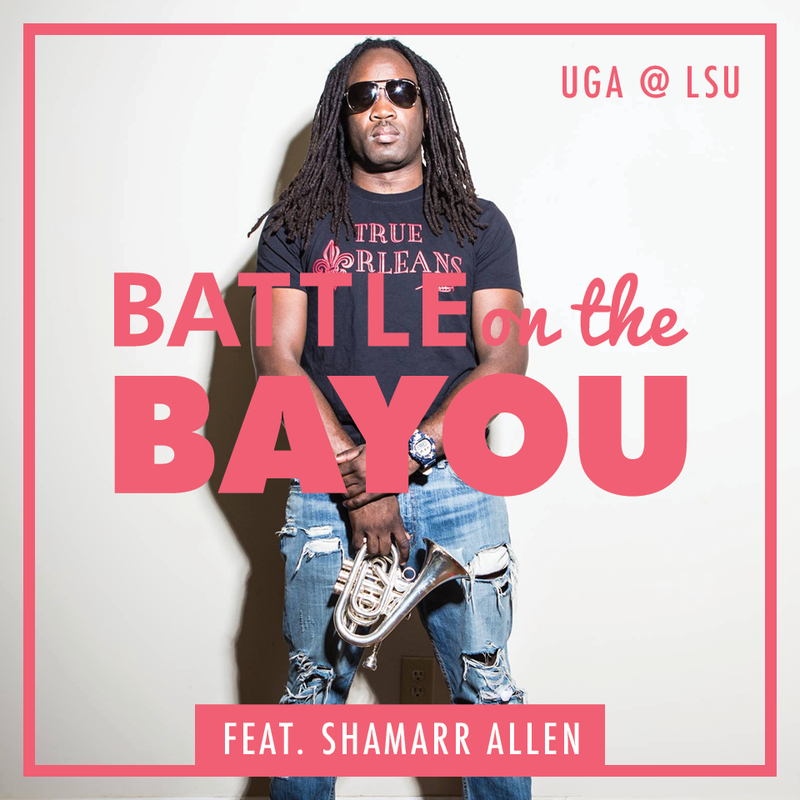 Live Nola styel band, Shamarr Allen + Live DJ w/ The Mad Violinist. 10am - 3:15pm: TAILGATE PARTY w/Bottomless Beer, Gameday Meal catered by WalkOn's Bistreaux & Bar, Live Entertainment Band + DJ, branded Koozies + more to expect! - Transportation To and From New Orleans for UGA/LSU in Baton Rouge. 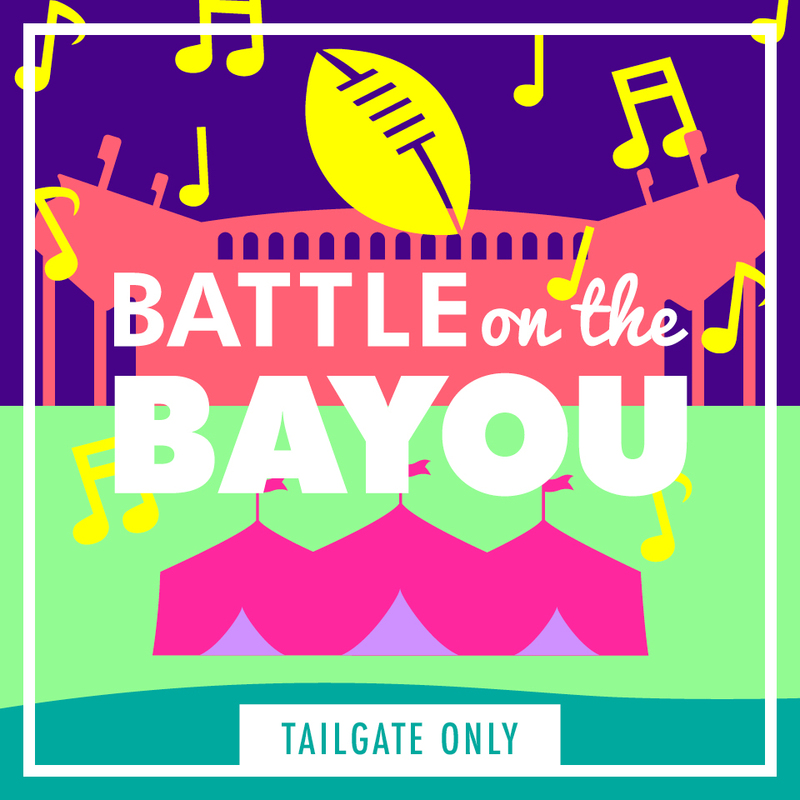 - Exclusive TAILGATE PARTY IN BATON ROUGE with BEER, FOOD, ENTERTAINMENT, Specials and more! Bottomless Mimosas & Bloody's for the entire 3-hour brunch. UGA Second Line Parade w/ Band through the french quarter! Plus more TBA...All gratuities, tax etc are inclusive. » THE NOLA SWING Arrival Party Friday in NOLA exclusive for all Dawg fans staying in New Orleans @ The Bourbon Drinkery. We have rented out both floors + courtyard and balcony overlooking Bourbon Street. Live band downstairs & DJ party upstairs with UGA flare and more TBA! » BATTLE ON THE BAYOU (BUSES + TAILGATE) Round-trip transportation from New Orleans to Baton Rouge including a morning NOLA Pregame at The Superdome + Tailgate Party w/ gameday meal & bottomless (unlimited beer) from 50+ running taps up until kickoff, Gameday Meal catered by WalkOn's Bistreaux & Bar, access to multiple Cash Bars (full liquor line + additional beer options) Live Entertainment, branded koozies + more to expect! Game viewing option, 12ft x 7ft TV, will be at Tailgate! »TAILGATE ONLY TICKETS Full access to Dawg Days Tailgate Party located right on LSU's golf course, just steps to Tiger Stadium. Ticket includes: Bottomless (unlimited beer) from 50+ running taps up until kickoff, Gameday Meal catered by WalkOn's Bistreaux & Bar, access to multiple Cash Bars (full liquor line + additional beer options) Live Entertainment, branded koozies + more to expect! *All tickets are non-refundable and will be final/non-transferable beginning August 1. Dawg Days Blocks - Are now CLOSED however if you are interested in a room email us at invite@dawgdays.org and we can provide hotel contact to add rooms at discount rate. » MARRIOTT NEW ORLEANS (French Quarter on Canal) - $239/night (singles + doubles) and includes complimentary wif-fi for all Dawg Days attendees booking within the block. 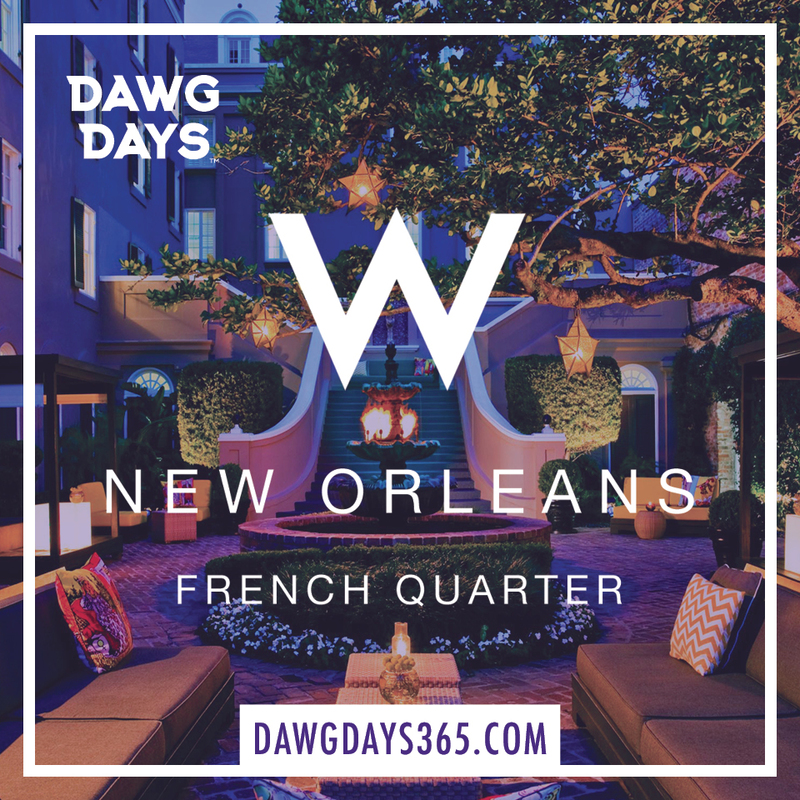 » W-HOTEL FRENCH QUARTER (New Orleans - French Quarter) - $289/night (Spectacular King & Queen doubles) and includes a welcome drink for all Dawg Days attendees booking within the block. 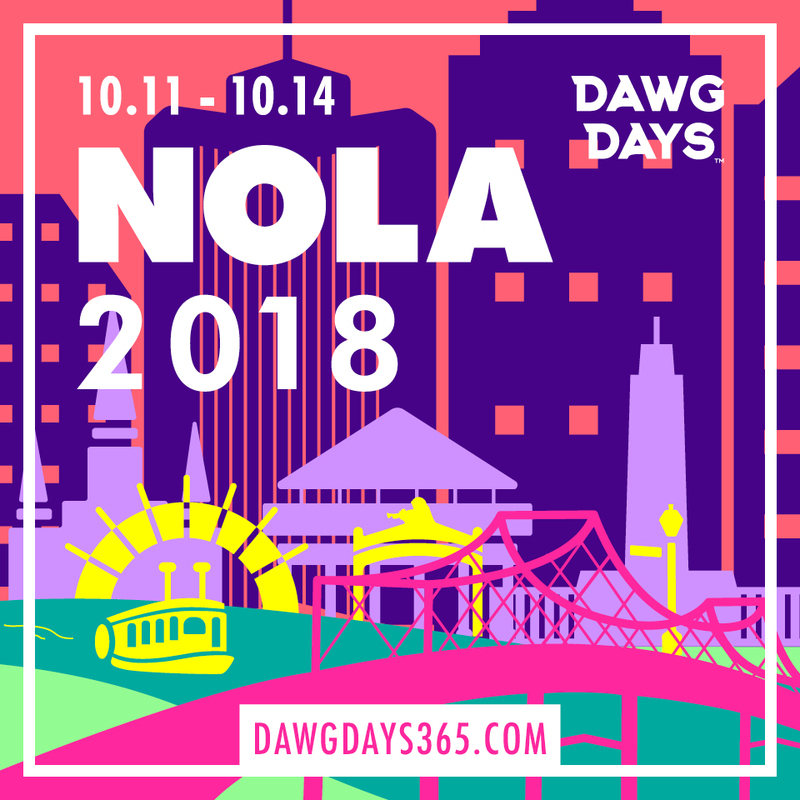 If you are traveling with a group that purchased passes separately, please email invite@dawgdays.org with the names of all ticket purchasers so we can ensure you are placed together. UPDATE 10/2: Buses officially sold out, no additionals will be added. Tailgate Only still available + Boozy Brunch a few tics remain! Final Details to all attendees for all events will go out shortly! UPDATE 9/16: Buses currently sold out, a very final release of spots will be Tuesday 9/18 @10am. Boozy Brunch Tics expect to sell out, there will be no add ons due to venue caps. UPDATE 9/12: Boozy Brunch less than 100 tics remain, Tailgate Only tics are Now Open (very limited supply) and Hotel Block ends Today! UPDATE 8/28: Tailgate Only tickets now available for those already in Baton Rouge! UPDATE 8/23: Tailgate Only & additional Bus+Tailgate Passes to go on sale next Tuesday 8/28. UPDATE 8/21: Buses currently sold out, working on adding more and will update the site when available. UPDATE 7/18: Limited Boozy Brunch Tickets now available! UPDATE 7/4: Happy 4th of July! Additional rooms added to the hotel block and now available online. Weekend festivities and venues confirmed and will be release next week. UPDATE 7/2: Primary hotel block sold out. Dawg Days is working to add more rooms. UPDATE 4/30: Hotel block availability extended through May 30. UPDATE 3/14: Early Bird passes ends Friday, 3/16. Hotel Blocks rates guarenteed until April 1st. UPDATE 2/21: EARLY BIRD discounted tics Now Open! Regular price will show once sold out. Additional NOLA parties will be released in coming weeks, stay tuned! UPDATE 1/15: Tickets to go on sale early Feb!